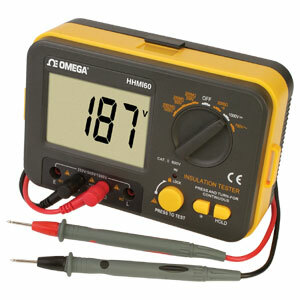 HHMI60 is a compact and easy to use digital insulation tester. Its main features include: ease of operation, wide test range, highly stable performance, backlit LCD, data hold and auto power off. Low Battery Indication: <7.5V approx. Nota: Comes complete with operator’s manual, test leads, crocodile clips, shoulder strap and six 1.5V “AA” batteries.